headed off to the Mediterranean with her girlfriends. Read on about her travels during a much-needed and very relaxing vacation. Going on vacation with your gal pals is about more than just having fun. It’s a prescription for happiness. Research shows that bonding with your girlfriends is an integral part of women’s health, and it can affect many aspects of your life. This trip was long overdue and much awaited – Turkey and Greece have always been dream destinations for the girls and me. The perfect weather (pre-spring) meant it was the right time to travel, so off we went – Kiran, Aruna, Shanthi, Vineetha and me. First stop on our list was Turkey where, after landing, we were met by a car that took us to our hotel, the MDC Cave featuring rooms akin to caves. Cappadocia is famous for its hot air balloons and cave-like living structures, some actual caves that have been dug out into living spaces. On our first day, we took the northern tour covering the Göreme Open Air Museum, a UNESCO World Heritage Site that serves as a monastery. It consists of many structures standing beside one another, and each monastery has a church inside. Every single one was fascinating. We saw frescoes in the cave churches, decorated with scenes of the Old and New Testaments dating back to the 10th century. 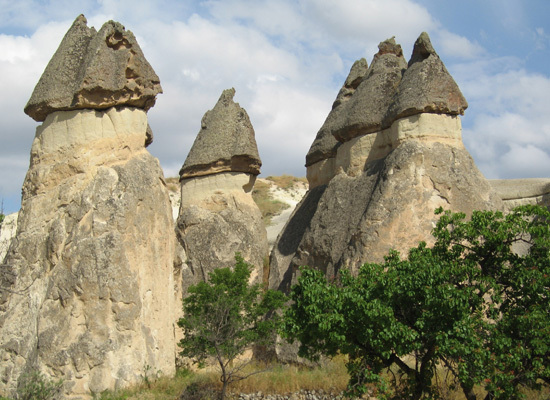 Other sights we saw on the tour included Urgup’s chimneys, Devrent’s rock formations, and Monk’s Valley. 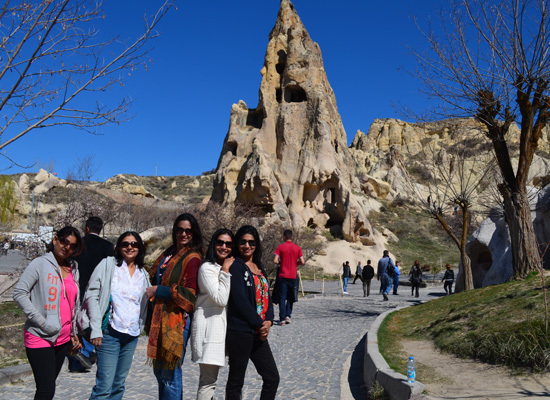 The following day featured a tour of southern Cappadocia, where we saw the Kaymakli underground city. At 3,500 years old, the place is astounding on many levels (literally). One of the biggest underground cities of Cappadocia, Kaymakli has a total of eight levels that even include stables and wineries. We flew out of Cappadocia and on to Izmir, where we spent a night at the Orty Airport Hotel. The following morning, we drove to Kusadasi, where we checked into the Louis Cruise and sailed off to Athens and the Greek islands of Patmos, Heraklion, Santorini and Mykonos. In Patmos, we visited the Monastery of St. John the Evangelist. In Heraklion, it was the Minoan Palace. Santorini was something else, what with the stunning views, spectacular sunsets, open-air cafés, and the Oia Village perched on the Caldera Rim. The monuments of Athens must be seen with one’s own eyes – the Parthenon is particularly popular and steeped in history. 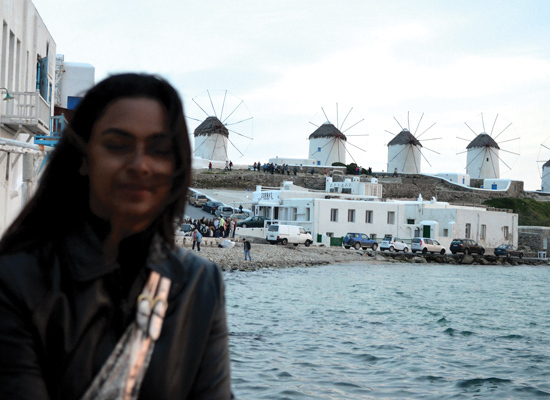 Our last stop was Mykonos, known for its windmills, waterfront cafés and nightlife. It was beyond beautiful. Our trip ended where it began, in Turkey. From Kusadasi, we flew to Istanbul and stayed at the Novotel, centrally located with easy access to local attractions and tourist spots. 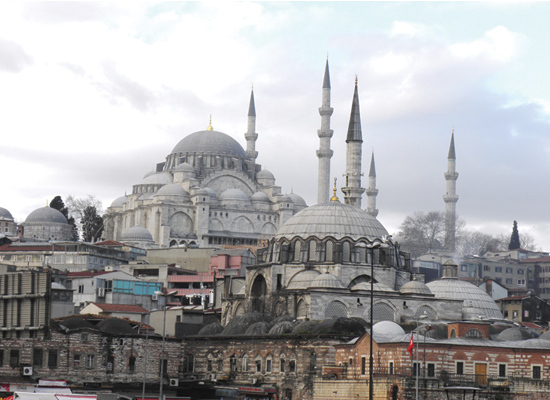 Some of the more popular ones are Sultan Ahmed Mosque, also called the Blue Mosque because of its turquoise tiles; the Hagia Sophia, where the architecture is a unique blend of Christian and Islamic styles; and the Topkapi and Dolmabahçe Palaces with harems and jewels taking one back to an age of imperialism, war and invasion. Don’t miss the Galata Tower, a watchtower that was used to guard against enemy attacks. The Bosphorus Cruise on the river that divides the European and Asian sides of the city was lovely, and the riverfront is speckled with cafés and restaurants featuring a variety of gastronomic fare. The food is mostly non-vegetarian, served with breads and salads. This article would be incomplete without talk of the Grand Bazaar, a fascinating plethora of shops with Turkish goods and specialties. Be careful to check for quality when you shop here, and do your best to bargain and bring the price down. Turkey is famous for lace, carpets, lanterns and many more wonderful things. Also worth a mention is the Istanbul nightlife, another aspect of the city that you simply must experience.